It's possible to archive courses in AppicalNow. By archiving a course you can hide courses that are no longer being used, instead of deleting it completely. This leaves you with a clearer view of courses that are currently being used by your organization. Archiving a course will also hide it from the overview while inviting users and reporting. Step 2. 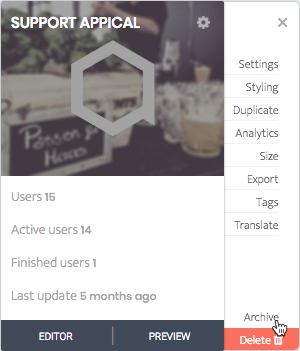 Click on the gear-icon in the top right corner of the course that you want to style and select ‘Archive’. Step 3. Click on 'Archive' in the pop up that appears. To activate an archived course, navigate to 'Courses' in the menu again and click on 'Archive' at the top of the page. Step 2. Click on the gear-icon in the top right corner of the course that you want to style and select ‘Activate’. Step 3. Click on 'Activate' in the pop up that appears. Awesome! You now know how to 'Archive' and 'Activate' a Course.